Universal Transformer, AC 12V 1.6A Ideal for use with Halogen (indoor) lamps and other low voltage consumer products. 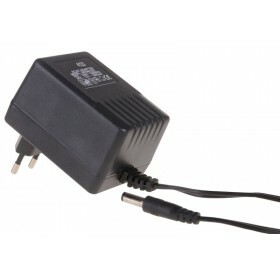 With this adaptor you have a galvanic separation between line voltage and low voltage. TÜV / GS approved, with overtemperature shut down, which is impossible to reset. Universal Switching Power Supply, CC 3-12V 1.5A, Input AC 100-240V AC/DC-Adaptor in latest eco-friendly-technology. Combined with the wide range of line voltage from 100 - 240 V AC max. output current of 1500 mA and output voltage of 3 - 12 V DC; together with the included plug set of 6 pcs the adapter can be used very universal. The powerful unit is provided with short circuit protection, automatic thermal and overload cut off. 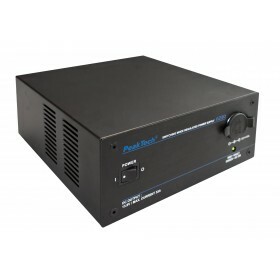 Switching Power Supply, DC 3-12V 3A The PeakTech 1320 switching power supply is mini size and lightweight with characteristic of high efficiency. It is designed to select 6 DC output voltages (3 V, 4.5 V, 6 V, 7.5 V, 9 V and 12 V) to be used for different kinds of battery operated equipments in field of marine/automotive and hobby. Industrial Switching Power Supply DIN-Rail Mount, DC 12V 10A Compact DIN mounted 120 W switching mode power supply. Designed for a wide range of control equipment which demands good quality regulated DC power source with excellent EMC immunity and electrical performance in an industrial environment. Up to five units can be connected in parallel. Switching Power Supply with Lighter Socket, DC 13.8V 33A Switching power supply designed for radio equipment, immune to radio frequency interference at close range. The overload protection, over temperature protection, short circuit protection and over voltage protection, ensure better reliability and safer protection to both the power supply and the connected load.